Lily’s Story is a novel about a remarkable pioneer woman, born in the backwoods of Lambton County, Ontario in 1840. Lily’s struggle to survive and grow and discover her place in the scheme of things is complicated not only by the ordinary travail of frontier living, but by the impact of historical events themselves: the railway rivalries of the 1860s and 70s, the accidental discovery of oil at Petrolia, the grand tour of the Prince of Wales in 1860, the Underground Railroad ferrying liberated slaves to safety in Canada, the Riel Rebellions, the Great War and the influenza pandemic that followed it. During her long life, Lily witnesses the birth of a nation, and the founding and rise of her home village of Point Edward. Lily’s Story is part history and part fable, replete with historical personages and a bizarre gallery of local characters. It is ultimately a story of survival and loss, about aging and the changes it brings, and about the role of memory itself. This engrossing historical drama comes from the acclaimed author of The Rebellion Mysteries starring Marc Edwards. In his masterwork of historical fiction, Don Gutteridge captures in fine, fully sensory detail the conflicts and changes of early Canada, and the prejudices, hatreds, disputes and loyalties involved in its development – all depicted through the singular experiences of a woman named Lily through the decades of her long life. There is blood and disgrace, passion and kindness, love and heartbreak and courage in Lily’s Story, every moment vividly, intimately rendered. Beginning in Lambton County, Ontario in 1840. Lily’s Story follows its namesake lead character on an extraordinary journey. Living most of her life as an orphan after the death of her mother and her father’s abandonment, Lily makes her way in a difficult world. Uneducated and with little support from her remaining family, she finds herself in some interesting situations; through marriages, babies, physical labor and abuse, Lily struggles to look after herself and those around her. Life is not easy – women are little more than possessions, there are few opportunities for schooling, and the future is bleak. When speaking to a politician who proclaims the importance of everyone getting out to the polls to have their voice heard, Lily simply replies, “I don’t get no vote, I’m a woman.” Racism also abounds; escaping US slaves are smuggled into the country, often to find a cold welcome, and Native Canadians are denigrated, while those attempting to enter white society change their names to conceal their heritage. But there is love and camaraderie among the poor – they fight and reconcile, they help each other and present a united front to the upper classes of society. Surrounding these everyday situations, the country is in upheaval – the Riel Rebellion, the First World War, the 1918 influenza epidemic; cities are growing and Canada’s identity is emerging, Epic by any description, Lily’s Story shows readers a beautiful and brutal picture of Canada’s early years, and although the main character rarely speaks, her voice rings clear in every word. Don Gutteridge literarily dramatizes the parochial in this frontier tale taking place in Lambton County in the 19th century, but in a way that does not overly romanticize or sentimentalize the lives of its characters. The prose is exceptionally rich, reminiscent of Ernest Buckler’s The Mountain and the Valley. A narrative that spans from 1845 right through the First World War, there is something of a haunting yet non-maundering apologia, and yet the author contains it in the subtle tones to keep emphasis on the very human story that unfolds. That being said, it is less a story centred on characters as it is one focused on the geography of the region where the characters play out. It is the dramatization of a territory that lends Lily’s Story an almost visceral feel, aided in part by Gutteridge’s masterful strokes of descriptive, parochial colour that places it in the tradition of literary high modernism. Gutteridge, a former Education professor, arranges all the ingredients of what a good historical fiction in this genre requires: erudition, and a narrative exquisitely contoured by historical facts that are just dense enough to provide believability without being obtrusively self-announcing, and in just the right density to maintain a continuity where the story is not just an ornament hung on those details. What appealed to this reviewer was the delicate touches that truly bring out the landscape in a non-obtrusive, unforced manner, filtered through the challenges of a frontier people. “Don Gutteridge’s ‘Lily’s Story’ is a tour de force, chronicling the life of an orphaned child in Upper Canada, facing the trials and tribulations of rural and small town life in the mid nineteenth to the early twentieth century, and doing it all through the eyes of a woman and the special challenges they faced. Lily is a tough nut, willing to fight her corner when necessary but also willing to use hard work and common sense to achieve her ends. There’s nothing the matter with taking in laundry and scrubbing floors if it pays the bills and puts food on the table and clothes on their backs. Lily faces down blizzards and disease, near poverty and even fire. She bears children in her home overseen by an inebriated but well meaning mid-wife. And she can still see the humour in the small minded actions of the so-called Christian clergy in their attempted dealings with her. Along the way Lily has both husbands and children, and lovers in high office. Her problem is that she outlives so many of them. Known variously as a washer woman, a fallen woman, a witch and a saint, Lily chooses the life literally “on the wrong side of the tracks” in the railway town of Point Edward. She becomes a monument to the town’s past, just as much as the War Memorial erected the site of her former cottage. In Lily’s story, Don Gutteridge proves yet again his mastery of historical fiction, and his unique ability to conjure up characters who are both engaging, and believable. Following the long life of an original Upper Canada pioneer woman, Lily’s Story plays out on the wonderfully rich background of early colonial Ontario that is both painstakingly researched, and immediately accessible to the reader. One can almost smell the pine and moss of Lily’s childhood homestead. Gutteridge also adds a characteristic touch of humor when presenting his well-represented historical figures, John A. Macdonald vomiting on the hustings while on the campaign trail had me in hysterics. Lily’s story is a long read, and at times meanders far from the beaten track of the narrative, but it is well worth the perseverance. The richness of the portrait it presents to the reader is undeniable, and I would recommend it to any reader with an interest in the colonial history of our province. Don Gutteridge is truly a master of his craft. Don has fashioned a story of an indomitable woman who faces harrowing hardships with uncompromising dignity. Her steadfast courage really appealed to me. I was also impressed with the way he has threaded together local and national themes and characters with a Royal tryst for added intrigue. A compelling aspect of this tale is Don’s portrayal of small town Ontario life with all of its Dickensian characters and teapot tensions. Throughout, his sometimes charming and sometimes hilarious sense of humour lightens the story. As well, his willingness to tackle difficult racial, class, gender and religious issues inevitably broadens the impact of Lily’s life story. Finally, I have always respected his facility with the language. His depictions, for example, of the early Southwestern Ontario landscape and the passing seasons left me wondering at times if I had wandered into the midst of a delightful epic poem. The period the story encompasses, three fourths of a century or so, is of course the seminal stage in the birth and growth of Point Edward and its adjacent territories, the metamorphosis from semi-settled, semi-nomadic frontier life to more or less civilized, grounded living. Existence for these pioneers was harsh, with much drudgery and physical hardships and entirely lacking the social schemes we take for granted to cushion the blows life throws at us. Although some traces of pageantry and grandeur come their way at irregular intervals to remind them of the great imperial enterprise of which they are a peripheral part, there are few joys or pleasures in their lives other than the most basic ones, and there is much pain, especially the pain of loss of loved ones. What appears to sustain them is an indomitable spirit allied to a strong sense of wit and irony. Lily is thus their ideal representative in that she has no sense of entitlement or even expectation of fair play, but is the ultimate Stoic and entirely admirable. As a minor actor, indeed in a frequently menial role, in the heroic enterprise of taming the wildness and creating civilization, she expects no recognition, seeks no plaudits and accepts losses and disappointments with courage, resourcefulness and even equanimity. And these are the qualities the task at hand requires. In her practical philosophic stance there is no room for fear of the vagaries of the future or even of death. This is the courage that sustains her even as some of her neighbours forget that she ever had a past or a name or a life other than Granny Coote; her sense of self is still strong. And her story is well worth the telling; even for this reader, whose forebears never stood on the soil of the New World, Lily’s story is part of my cultural heritage, a racial memory I can claim as my own. Lily’s Story is for me then above all a novel of place; it is in part a recognition of the place to which I immigrated. In my early years in teacher education when my school visits were mostly to rural elementary schools, I developed a habit especially in the springtime of the year of poking about in old cemeteries and peering at the inscriptions on the most eroded tombstones. What I was doing, though I didn’t realize it at the time, was looking for hints of Lily’s story, of the sights and sounds and smells of the world she and her contemporaries inhabited. The novel has brought much of that to life for me, not just the ambience of her daily life but also the set vignettes of occasions in places we know only in their twenty first century incarnations:– Lily’s brief sojourn in London during her pregnancy; the frenzy during the oil boom in Petrolia and Oil Springs; the Underground Railroad and the threat of US slave-recovery laws; the chicanery of the railway companies; Sir John A. quietly vomiting into the bushes at the hustings. And then there is the poet’s instinct for the exactly right phrase, “the rite words in the rote order” as Joyce called it, as in: “From the left side of the platform, Mr. Mackenzie skewered him with his Presbyterian eye.” And then there are the vivid recreations of nature, winter storms, torrid days, polar nights, dogs and deer and flowers and forests and gardens. Gutteridge has given us a cornucopia. The novel is an epic tour de force that will captivate readers from the beginning to end. It whisks you off the couch and into one woman’s life and when you reach the final page it’ll feel like you’ve known and admired the plucky woman all your life. Wow. Just wow. I’m not sure if that’s enough of a statement for a review, but those were my thoughts when I finished Don Gutteridge’s book, Lily’s Story. The beautifully wrought historical epic follows our protagonist, Lily, as she traverses through life, from her childhood with a difficult father to her life as an old woman. In between, she experiences a whole lot, from the Underground Railroad that brought American slaves to the safety of Canada, to the Riel Rebellion, to the Great War and the flu epidemic that threatened the lives of all it touched. Add to that all of the human elements of Lily’s story, births, marriages and deaths, connections and losses, friends and foes, and you have one very powerful and complete story. 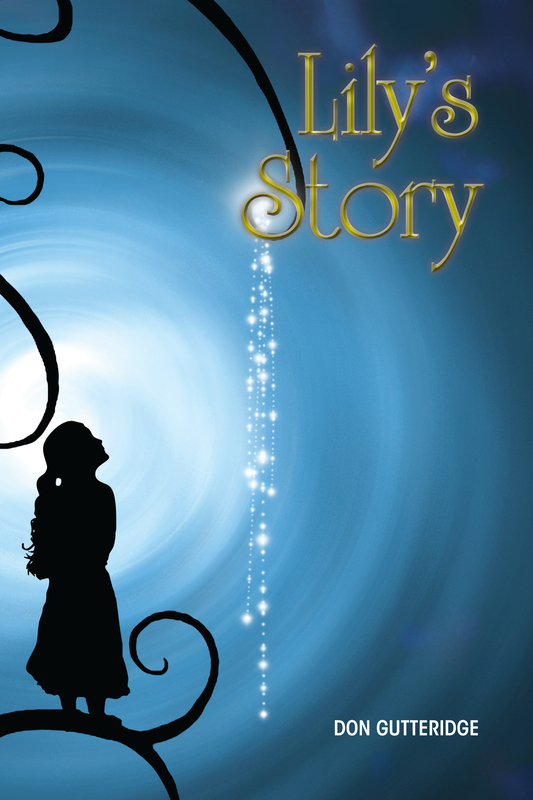 Lily’s Story is not a book that you can read all in one sitting. Weighing in at 828 pages, Don Gutteridge’s novel is a masterly work that deserves time and attention to devour. That being said, once you start Lily’s Story, you won’t be satisfied until you reach the end. Gutteridge’s ability to draw characters that are so realistic, so likeable, is second to none. His descriptions of Lily’s home in Ontario are so beautifully rendered that it is almost as if the landscape, the environment, becomes another character. Lily’s Story would appeal to any lover of fiction, but especially historical fiction of epic proportions. It is my great pleasure to highly recommend Lily’s Story, and I look forward to reading more by Don Gutteridge in the future. There’s a big difference between a novel that describes events and one that plunges its reader into its setting and world. Gutteridge holds the ability to bring this strange frontier world to life as readers absorb Lily’s interests, fascination with the unknown, and reactions to how her parents settle the land. These feelings are precisely captured in succinct, hard-hitting descriptions (“Lil’s bones rang like tuning forks.”) filled with insights on the moments and seconds of Lily’s experiences of her world. A solid historical novel will impart this sense along with facts that depict bygone times and worlds. Lily’s long life and many experiences take her from frontier times to the birth of a new village, a new home, and a new world. That she carries readers along for a heady ride through politics, sleigh rides, train rides, and the advent of World War I makes for a compelling read hard to put down and especially recommended for readers who want more than ‘show and tell’, but a vivid saga that brings a woman’s many years and transitions to life against the backdrop of astounding changes. Read or write a review of Lily’s Story on Goodreads here.